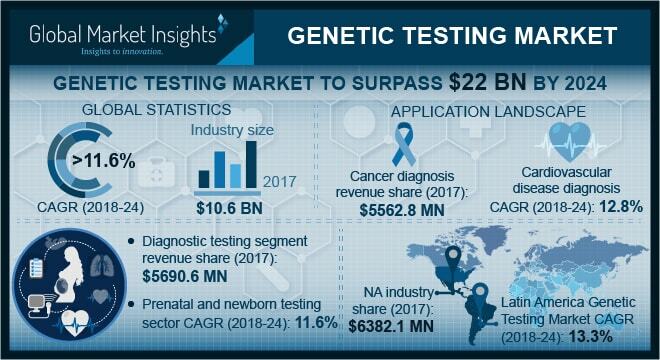 Genetic Testing Market size is set to exceed USD 22 billion by 2024; according to a new research report by Global Market Insights. Increasing applications of genetic testing for early detection and prevention of oncology and genetic diseases will accelerate the market growth throughout the forecast period. Around 6,00,920 cancer deaths occurred in the U.S. in 2017. Growing awareness among patients pertaining to early diagnosis of diseases will lead to timely treatment resulting in reduced mortality. Rising prevalence of diseases such as cancer, cystic fibrosis, Alzheimer’s and other genetic diseases worldwide will result in increasing number of people undergoing genetic testing for early diagnosis thereby fueling the market growth. Innovation in genetic testing leading to enhanced efficiency, high sensitivity and safety will serve to be a high impact rendering factor. Technological advancement in scientific research as well as research instrument is increasing the importance of genetic testing. Availability of sensitive and efficient DNA sequencing technique for prenatal genetic testing allows detection of minute amount of DNA circulating in the mother’s blood during early stages of pregnancy. Adoption of such non-invasive prenatal testing (NIPT) at a very early stage of pregnancy is increasing worldwide thereby augmenting the industry growth over the forecast period. However, the high cost involved in genetic testing coupled with ambiguous reimbursement structure in different regions, lack of experienced professionals and lack of advanced infrastructure in developing economies will hamper the industry growth during the forecast period. Cancer diagnosis segment accounted for the largest market share in 2017. Cancer is the second leading cause of mortality globally. According to, The Institute for Health Metrics and Evaluation (IHME), the number of cancer deaths accounted for around 8.9 million in 2016. Around 5%-10% of all the cancers globally are caused by inheriting genetic mutation. Notable improvements can be made in the lives of cancer patients by diagnosing cancer early and avoiding delays in care resulting in greater probability of surviving, less expensive treatment and reduced morbidity. Rising prevalence of cancer worldwide will significantly accelerate the cancer diagnosis segment over the forecast period. Genetic testing market in Japan accounted for the largest market share in Asia-Pacific region and is expected to show significant growth over the coming years. This is attributable to factors such as growing advancements in the technology, availability of new tests, rapidly rising patient pool and increasing government investment in R&D. Further, India and China are expected to grow at a faster CAGR due to the increasing disposable income, rising affordability and growing investments in healthcare infrastructure. Aforementioned factors will further fuel the regional growth throughout the forecast period. Some of the notable industry players operating in global genetic testing market are 23andMe, Abbott Molecular, Bayer Diagnostics, Biocartis, BioHelix, BioMerieux, BGI, Celera Genomics, Cepheid, Counsyl, deCODEme, Genentech, Genomictree, Genomic Health, HTG Molecular Diagnostics, IntegraGen, LabCorp Diagnostics, Luminex, MolecularMD, Myriad, Natera, PacBio, Pathway Genomics, Qiagen, Roche Diagnostics, Sequenom and Siemens. Industry players are focusing on strategic expansion through acquisitions, mergers and collaborations help the players to strengthen and enhance the product portfolio. For instance, in December 2017, Roche acquired Ariosa Diagnostics, a molecular diagnostic testing services provider, to enter the non-invasive prenatal test (NIPT) and cell-free DNA testing services market.